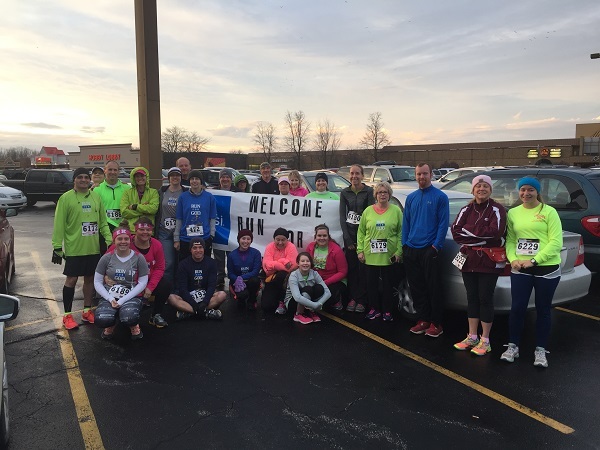 Online registration for this event is closed, BUT You can STILL REGISTER the day before at packet pickup at Concord Mall from Noon - 7pm on Wednesday, November 21 at 3701 South Main Street, Elkhart, IN or on race day Thursday, Nov 22 from 6:30am - 8:15 am at the Concord Mall. Enter through the Main Street entrance by offices by Hobby Lobby! "Menu pricing" (no increase on race day) $15 for any event age 13 and up, $7 any event youth 4-13, kids 3 and under are FREE! Chip timing is $4. Long sleeve silver unisex performance shirts are $15. We also have some from last year for $5. Register any adult or youth (age 4 and over) for the 10k, 5k, or 1 mile. Add $2 to CUSTOMIZE long sleeve event shirt! Faith Mission is the only emergency facility in Elkhart County where shelter, meals, clothing and long-term recovery programs are provided all in one place. Our doors are open 365 days a year to Michiana’s hungry and homeless men, women and children. On average over 700 individuals are housed in a year. Once a person’s immediate needs are met Faith Mission offers long-term care and life-changing solutions so that men and women begin to understand the causes of their problems and gain the skills and spiritual strength necessary to recover and start new lives as successful productive members of the community. To celebrate our 10th year, we have special participation medals ! Again, no awards ceremony because we know you need to get back home right away and on with your day! $25 if you can "Catch the Turkey!" Gravy Boats to top 3 M/F in 5K and 10K Races (5K walk and run timed together) No official "awards" ceremony - Gravy boats will be distributed immediately at finish line. We know you want to get home and on with the day! This year, we are offering silver long sleeve tech shirts for $15. We will also have some shirts from past events for sale for $5 each, while supplies last. If you have a group of three people or more, you can opt to pick up all the race bibs together at the Group Pick up Station. This is for your convenience, so if you are having a family outing, not everyone has to wait in line! And for most groups, there are several last names, so we want to make this as streamlined for you as possible. Any shirts, race numbers and timing chips will be in the packets. Please indicate the Group Name for pick up on your registration form! Training With a Group Helps Keep You on Track! Volunteers! If you are not a runner - you can participate as a volunteer! We need about 50 energetic people! Hey- no big plans for Thanksgiving in the morning? Don't sit at home with the blahs! Join our family and help us put on this fantastic event for the people who are trying to get back on their feet. Most of these areas are for one hour or less! We need help! Please click on the *Contact the Organizers* button on the left hand side of this page to volunteer! Don't forget to have your photo taken by one of our many photographers. And share your photos with us on Facebook! When this page loaded, the official time was 8:16:27 PM EDT.